Great article. Many folks will give every excuse imaginable. We are all human, and try to be reasonable, but after 30days and NO payment, or even $500 bucks---time to evict. This is a business not a charity. This is america--money trumps everything and renting business is no different. This is the only time I've been to your site. Thanks for explaining more information. Do the same actions required for eviction apply if the tenant is renting a room (or guest house) out of your own personal home? Response by Carlton C. Casler: Yes. The LL/T Act applies "to the rental of dwelling units." Your house is a dwelling unit and, therefore, the Act applies to you and your house and/or guest house, which means that all the requirements of the LL/T apply to any tenant renting a room or a guest house. In the case of a person renting a room and having access to common areas (i.e., kitchen, bathroom, living room, etc. 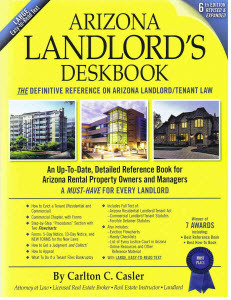 ), the LL/T Act refers to that tenant as a "roomer" (see ARS Sec. 33-1310(13): " 'Roomer' means a person occupying a dwelling unit that lacks a major bathroom or kitchen facility, in a structure where one or more major facilities are used in common by occupants of the dwelling unit and other dwelling units. Major facility in the case of a bathroom means toilet, or either a bath or shower, and in the case of a kitchen means refrigerator, stove or sink.” The only distinction in the Act between a roomer and a tenant appears in ARS Sec. 33-1314(D): “Unless the rental agreement fixes a definite term, the tenancy shall be week-to-week in case of a roomer who pays weekly rent, and in all other cases month-to-month.” There are no other distinctions. Treat the roomer as you would any other tenant, with the sole exception being if the roomer pays rent weekly and you wish to terminate the roomer’s week-to-week tenancy. To the best of your ability, take on a worst-case viewpoint. Your renter may seem nice, but you can never be positive how and when things may become different. List out each potential circumstance that could cause the delivering of an eviction notice and write out the reasons in very clear terms in their rental lease agreement. The tenant agrees to all the terms when they sign the rental lease agreement. Landlords should conduct a background check of their future tenant, but they should also consider the side of the tenant if they want also to have a clear background of their landlords. A very helpful article. This should serve as a reminder to future tenants about tenant screening which is not just conducted by the landlord themselves but avails a background check service so any past delinquencies and disputes from your previous landlords are revealed. Be wary now and pay on time!